John Yagger had started to dread going out to a restaurant to eat. It had become a nightmare because he never knew if his meal was going to stay down due to constant indigestion and a difficulty in swallowing. "I went to see the doctor," he said, "and I had a hard time swallowing. They did an x-ray and he said I had an obstruction in my throat." As a result, John was diagnosed with a condition called Barrett’s Esophagus. Dr. Carmela Morales, gastroenterologist adds, "Although Barrett's is considered a benign condition, unfortunately there's a risk of progress to esophageal cancer." Dr. Sandeep Patel agrees. "And that is what we call intestinal metaplasia...it is one of the leading precursors to esophageal cancer which is one of the fastest growing cancers in the United States." Before John Yagger came to University Medical Center's Center for Diagnostic and Advanced Endoscopy, the only option given to him was to remove his esophagus and to move his stomach higher. "As you can imagine," says Dr. Morales, "that surgical procedure is very complicated and has a high degree of operative complications and mortality." 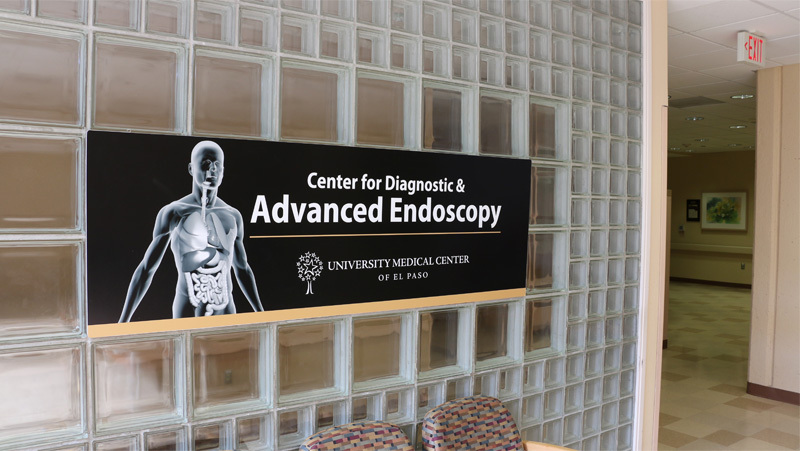 University Medical Center's Center for Diagnostic and Advanced Endoscopy offers a new non-invasive procedure using radio waves to deliver heat through a catheter to eliminate any diseased tissue in the esophagus. Healthy tissue is left untouched and is allowed to continue to grow. Treatment of suspicious lesions can dramatically decrease and prevent esophageal cancer. "Ablation is a procedure done with different technologies," states Dr. Antonio Mendoza-Ladd. "One of them is burning the layer that forms in the esophagus. It can be done with heat or it can be generated with cold energy." John’s cancer was removed completely through high frequency ablation. He was able to return to his home the same day of the procedure. In fact as John adds, "We stopped and had breakfast on the way home. Now you beat that one!" Ablation is just one of many unique procedures only available in El Paso at UMC’s Center for Diagnostic and Advanced Endoscopy. "We are going to be doing cryotherapy for Barrett's," says Dr. Mendoza-Ladd. "We are doing endoscopic ultrasound which this time is only available at UMC. Endoscopic ultrasound opens the gate to do a lot of interventional procedures. We go into the vial ducts. We can go into the pancreas. We can go into the abdomen, really." Dr. Garcia agrees, stating, "This is really important because we are providing a service to the community where before they needed to travel to San Antonio or Albuquerque to get these procedures done." Furthermore, states Dr. Patel, "...what that means is that essentially we are the gastroenterologist's gastroenterologist. These patients with complicated liver disease, bowel disease, pancreatic disease, esophageal disease....like Barrett's come to UMC because we have the equipment. We have the technology. We have the service line and the skill set to take care of these patients in a minimally invasive endoscopic manner." Thanks to donor support, University Medical Center's Foundation of El Paso has purchased three EVIS towers for the Center of Diagnostic and Advanced Endoscopy for a total of $147,288. These towers are used in every endoscopic procedure. Also purchased were two colonoscopes for $82,898 and the Covidian HALO Ablation system to treat Barrett's for $145,000. In addition and funded through a generous donation from Transtelco was the Texas Society of Gastroenterology and Endoscopy Live Conference for $20,588. Dr. Morales best states how "the community - by these generous donations - have really made these significant purchases a reality, and it is a true privilege as a community member and as a health care professional to be able to provide health care for El Pasoans in El Paso."